Elder abuse is a single or repeated act, or lack of appropriate action, occurring within any relationship where there is an expectation of trust, which causes harm or distress to an older person (aged 60 years and older). It includes physical, sexual, psychological/emotional abuse; financial and material abuse; abandonment; neglect; and serious loss of dignity and respect. The diamonds show the median value in the range of past year prevalence estimates reported by studies in the database. These do not represent national or regional prevalence estimates. 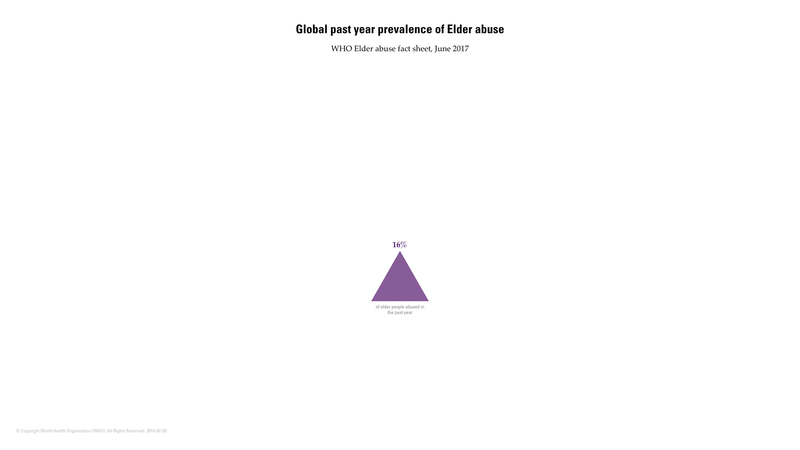 Use the buttons below to select different forms of elder abuse by country/area or by WHO region. The countries/areas in each WHO region can be found here. The triangles show the relative importance of the potential consequences of elder abuse. 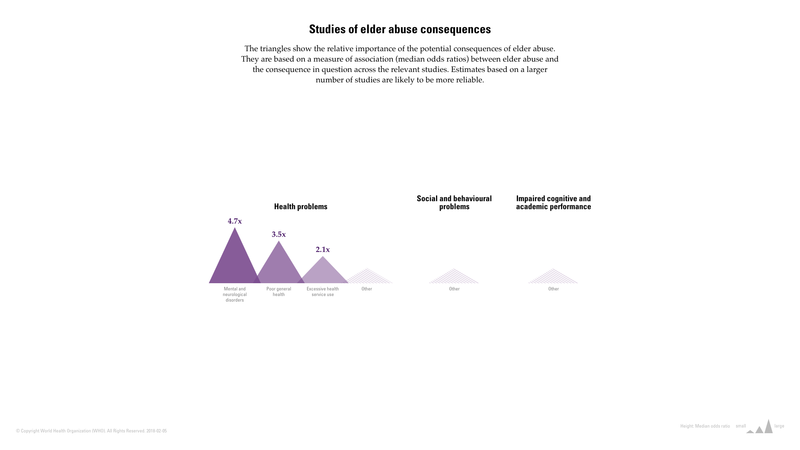 They are based on a measure of association (median odds ratios) between elder abuse and the consequence in question across the relevant studies. Estimates based on a larger number of studies are likely to be more reliable. 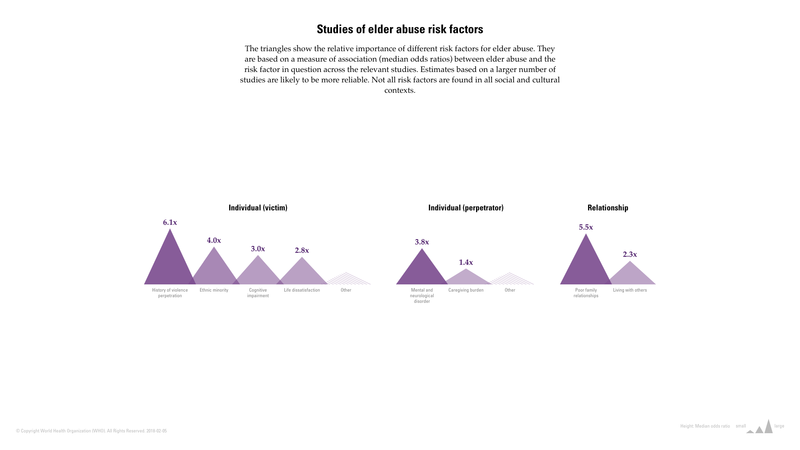 The triangles show the relative importance of different risk factors for elder abuse. They are based on a measure of association (median odds ratios) between elder abuse and the risk factor in question across the relevant studies. Estimates based on a larger number of studies are likely to be more reliable. Not all risk factors are found in all social and cultural contexts. Prevention strategies aim to stop violence from occurring in the first place. A list of these strategies appears below. Only strategies with data in the database are included. Other promising strategies may exist which will be added when outcome evaluation studies are published. Each strategy includes several different interventions across a range of effectiveness, with higher values indicating greater effectiveness. Click on each strategy name to see the intervention effectiveness studies. Response strategies aim to reduce the immediate and long-term consequences for victims of violence and/or offer treatment for perpetrators of violence. A list of these strategies appears below. Only strategies with data in the database are included. Other promising strategies may exist which will be added when outcome evaluation studies are published. Each strategy includes several different interventions across a range of effectiveness, with higher values indicating greater effectiveness. 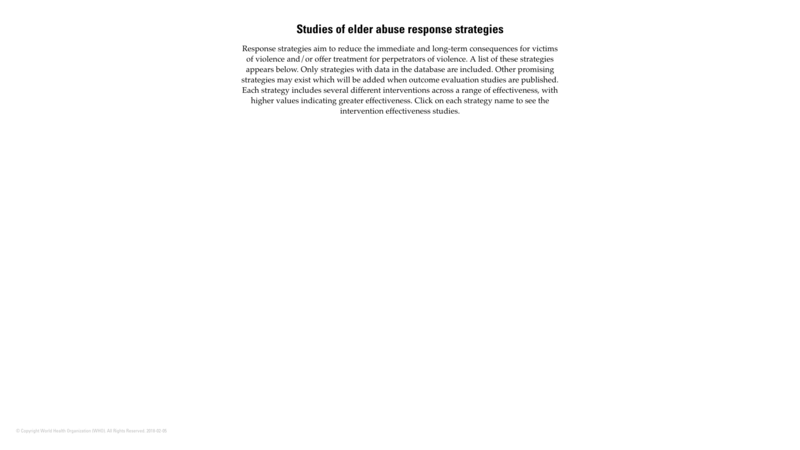 Click on each strategy name to see the intervention effectiveness studies. This section contains examples of strategies and specific interventions with some evidence for effectiveness. They have been chosen for illustrative purposes, and their inclusion in Violence Info does not mean that WHO endorses them. An intervention for individuals who physically abuse or neglect their elderly dependents. An intervention in which attorney and social worker teams work with abused individuals and their families. This section describes some of the survey instruments most widely used to measure the prevalence of elder abuse. 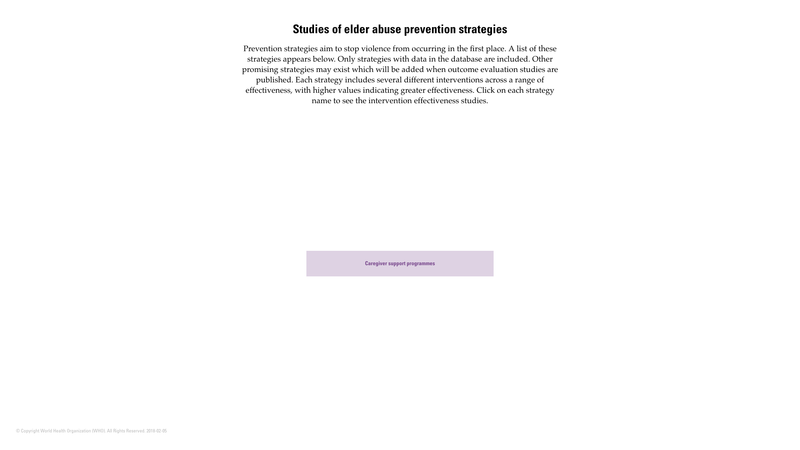 To measure one-year prevalence of the five main forms of elder abuse in older Canadians. To measure physical, emotional, and sexual abuse of older people. To provide nationally representative prevalence estimates of elder abuse and neglect in the community.